Greetings and welcome to the 20 new subscribers who joined since the last issue! Have you set up any wine tasting goals this year? Is improving your wine tasting skills or discovering new wine horizons part of your 2018 goals? This year I decided to be more adventurous in my wine tasting experiences and started this past Friday at a local restaurant. I signed up for the wine tasting event after receiving their inviting email. The theme was Northern Italy, a wine region that I particularly like and visited. I knew the tasting was not going to be what I expected when the waiter kindly offered us to start with a cocktail while waiting to the other guests. The setting of the event, the main and large dining room of the restaurant, created some challenges for our host, a very knowledgeable sommelier, and for myself. Most participants just wanted to have a good time on a Friday evening with their friends or loved one. I had to stay focused; the loud ambient music and the wonderful smells coming from the kitchen were distractions that I had preferred not to have during this wine tasting. Here are some tips if you happened to be in a similar situation one day. Read: A wine tasting event in a loud & good-smelling restaurant: My tips to enjoy the wines . During the same event, the sommelier described a Pinot Bianco (Tramin, 2015) as “having some minerality in the finish”. Explaining minerality is difficult as Nora, one of the newsletter subscribers, shared with me. The number of articles published on wine minerality, its origin, its descriptors has increased in the past few years. Just Google the term and you will end up with hundred of links. I searched the most recent and reliable literature to provide some answers for Nora and you all. Read: How to define wine minerality? . What is your biggest challenge in wine tasting? Please continue to share with me your challenges about wine and wine tasting by answering this very short survey . Do you have a specific question on wine tasting? Share your question(s) using this form. I will be happy to help you! 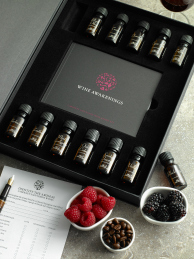 As a subscriber of Wine Tasting Tips, Wine Awakenings offer you a $15 CAD discount on any of their 12 aroma kits (retailing $149 CAD). Use the promo code IL01 when purchasing a 12 wine aroma kit online. If you are keen on the Master series (retailing $349 CAD and more), please contact directly Rita by e-mail to get your discount. 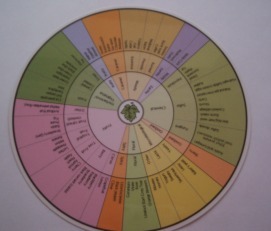 The wine aroma wheel is the basic tool to help you describe the aromas you perceive when smelling or tasting a wine. It’s a simple way to get you match the sensations you perceive with aroma categories that are generic in the center of the wheel (fruity, woody) towards more precise aroma descriptors on the outer circle such as raspberry or burnt toast. Add the wine aroma wheel to your tasting kit . If you liked this issue of Wine Tasting Tips, don't forget to forward it to your friends, family and colleagues.